The major numbers of forts in Gujarat were built during the medieval period to protect domains against invasion. These strong and unscalable forts safeguard peace and prosperity of the kingdom, allowing it to develop culturally and economically. 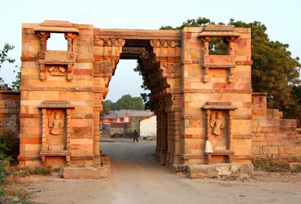 Mostly forts in Gujarat are made of stones and decorated with arches and wide gates. Though the principle design remains the same, but there were changes in design and architecture with advances in the methods of warfare. Lakhota Fort in Jamnagar, Pavagadh Fort in Panchmahal District, Uparkot Fort in Junagadh, Old Fort in Surat, Bhujia Hill Fort in Bhuj, Ilva Durga (ancient fort) in Idar, Dhoraji Fort in Porbandar and Zinzuwada Fort in Rann of Kutch are the famous forts of Gujarat. In the mighty walls of Gujarat forts hidden are the tales of courage and sagas of inevitable court politics.